Luang Prabang to Vang Vieng. We booked the ticket for the bus through a travel agency in the centre of town in Luang Prabang, we booked the ticket for 6pm expecting it to take around 6 hours and we’d arrive at our accommodation around midnight, not wanting to waste a day traveling. We made sure we arrived at the bus station in Luang Prabang with enough time and the tuk tuk driver dropped us off then said sit here. As the time approached the sat waiting but no bus appeared, first Conor went to ask. Are we sat in the right place? What time is the bus arriving? The man said the bus had been cancelled you need to pay 20,000 kip more. Conor came back to tell me and I said no way, I then went back to speak to the man and there was nothing said about paying extra. However our bus had been cancelled and we had to wait until 8.30pm to get the local bus. We waited for 2 and a half hours getting bitten to death and not very impressed. We finally saw a few buses which heading towards Vang Vieng and started moving towards them. Having never seen the sleeper buses before we thought they were great, reclining seats and wifi onboard great we thought. But oh no our bus was the 15 seater ‘local bus’ hidden behind the sleeper bus. 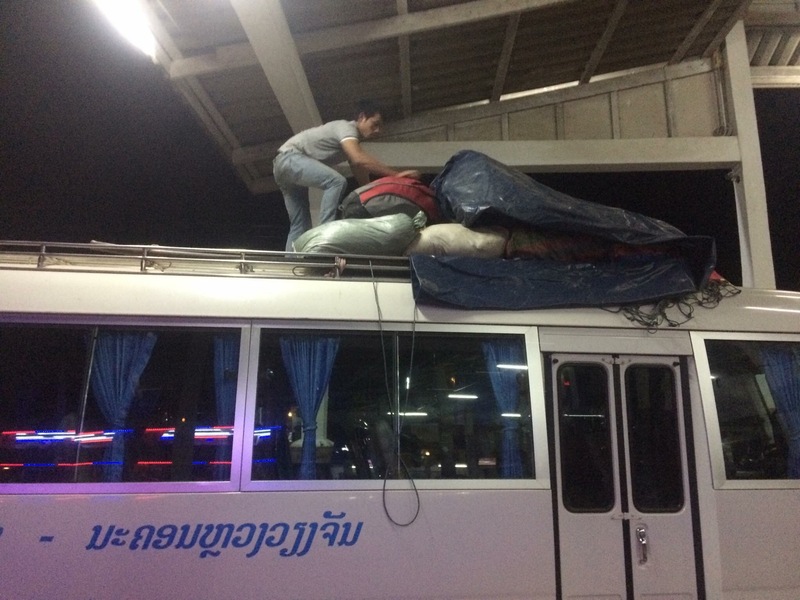 We queued up for the bus and the man said throw your luggage up here, our luggage was balanced on the top of the bus covered by a sheet. We got onto the bus and I was sat by the window next to a mother and baby breastfeeding and Conor was sat on the other side of her, just what we wanted. Luckily she offered to change seats with Conor so we were sat together. We were the only white people on the bus and no one spoke English. We set off in the pitch black with the driver thinking he was an F1 racer and the continued onto the windiest road. The road wasn’t only windy up on the edge of a mountain with pot holes all over it. I thought we might of been able to get some sleep on the bus journey but I could not close my eyes or take my eyes off the road. And then the best bit started, about 4 people both sides of us started being sick into bags, out of the window it was a nightmare. It wasn’t only cold from the window being open but smelt disgusting. 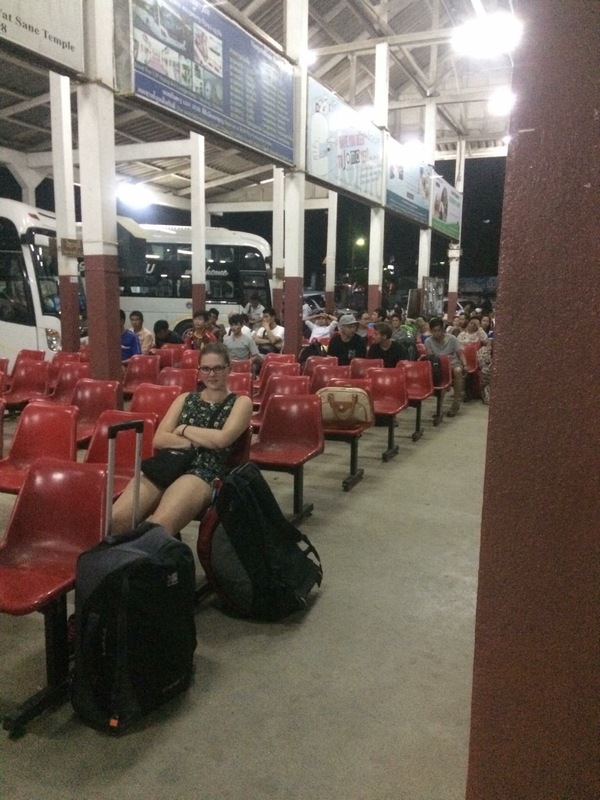 When we finally arrived in Vang Veing at 2.30am we got dropped off in the middle of no where but I was so happy to get off that bus I couldn’t care less. Luckily there was one tuk tuk waiting to rip off the tourists. We got onto the tuk tuk and asked how much, he said 20,000 kip. He took us around 2 miles over the river to our guesthouse and when we got off then decided it was 20,000 each!! To make things worst the guesthouse was disgusting, a lumpy bed with a single sheet to share with holes in the windows with dogs barking and chickens clucking right outside. We then had to struggle to put up the single mosquito net to make sure we didn’t get bitten anymore! As you can imagine it wasn’t the best nights sleep.